A total of 148 reports were received in this six month period, representing a consistent level of reporting with previous periods. Click to read full report. 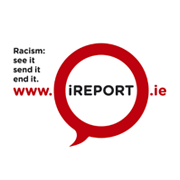 Just 30 (31%) of reports in this six-month period concerned racism in the media, or perpetrated through social media. Thisisamuch lower proportion than in previous periods. Analysis of theseincidentsis offered separately throughout the report, and is simply described as ‘media’ to cover mass and social media formats. Assault appeared in 22 reported cases, including 11 with injury. A further 4 cases involved serious threat to harm or kill. One case of fire was reported (arson not verified). Damage was involved in 26 (18%) cases, including against business (1), houses (15), vehicles (12), windows (14) and missiles (14). Abuse was reported in 73 percent of cases, with 32 cases of repeated harassment (22%) and 25 cases of lesser threat (17%). Verbal abuse was reported in 40 percent of cases, while ‘Being treated unfairly or differently in public’ appeared in almost half (46%) of cases, excluding media. Discrimination in service and refusal of entry were reported in 20 percent of cases. 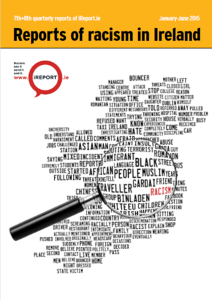 Graffiti appeared in 10 reports, the display of racist symbols or insignia, and other racist materials, in 16 reports, and written abuse in the form of letters or emails in 7 reports. Together, these constituted 24 percent of all cases. Telephone abuse appeared in 3 reports, and offensive ‘jokes’ in 23 reports. 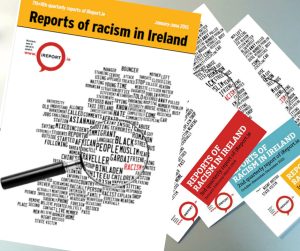 Click to see Racism in Ireland January-June 2015 infographic.